To construct a triangle when two of its sides and the included angles are given, let’s follow the examples. 1. 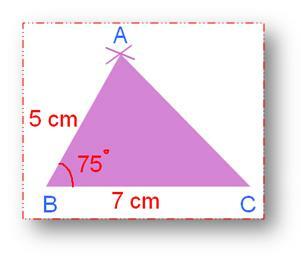 Draw a triangle ABC in which AB = 5 cm, BC= 7 cm, and ∠B = 75°. (i) Draw a line segment AB = 5 cm. (ii) Make ∠ ABC = 75°. (iii) Cut of BC = 7 cm. Therefore, ∆ ABC is the required triangle. 2. Draw a triangle ABC in which AB = 4.5 cm, BC = 6 cm, and ∠B = 80°. (i) Draw a line segment AB = 4.5 cm. (ii) Make ∠ ABC = 80°. 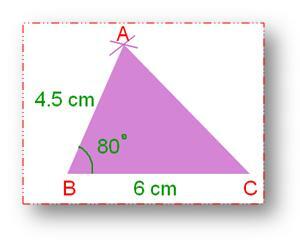 (iii) Cut of BC = 6 cm.